How to click checkbox/select option [Solved, it was a "macOS Mojave only" XClick installation issue] - General Discussion - Forum for Kantu Task and Test Automation and the free OCR API. Hi, Im running into an issue with clicking a parent check box that when on click an event happens that auto checks the child check boxes. Same issue with selecting an option/label. Ive been experimenting with xclick and xtype but I am having no luck. I am new learning this, please advise on what it is I am doing wrong. How do I use xclick/xtype to click check boxes and select options/values. The screencast is really useful. On a first glance, your macro looks ok and Kantu finds the right place to click. I see the highlighted rectangle around the best match position. As a first step to debug this, lets make sure that the XModules work correctly: => If you run the “DemoXClick” macro that ships with Kantu, does it work? If not: What operating system is this? Does not appear to be working. I am using Chrome Version 73.0.3683.75. Kantu version 4.0.1 on MacOs Mojave. Ah, after watching the second screencast I think I know now what this is: => It is the new macOS security feature You need to allow Kantu for Chrome (and/or Firefox) to control your mouse. 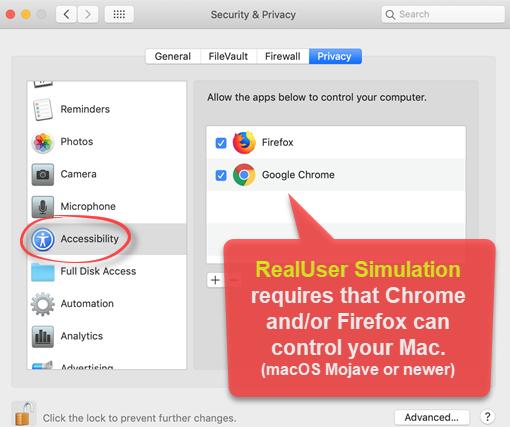 From this page: The first time you use a realuser command (XClick, XMove,…) your Mac will ask you to add Chrome and/or Firefox to the accessibility menu. But it does this only once. If you missed the dialog the first time, future realuser commands will fail silently and you need to give Chrome/Firefox the required permissions manually (as shown in the screenshot above). I am happy to report that was the issue. I apologize for taking up your time. Thank you so much for the speedy response!